You are here: Home / Blog Post / Signing up for something sinister? It’s not really sinister. This was just advertising a signup party … a chance for people to “sign up” to participate in an event. 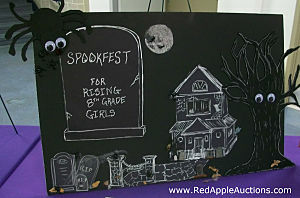 Of all the signups I’ve sold, I recalled something related to Halloween. Voila, this SPOOKFEST party materialized from the ether. Fifteen rising Grade 8 girls were treated to a fun-filled outing. They were picked up directly from school on a “haunted bus” where they were taken to the Cheesecake Factory for an early dinner. Then the bus transported them to a haunted experience (in other words, a haunted house). After this terrifying excursion, the bus transported the girls back to a couple’s home for dessert, where the parents could pick up their daughter at 10 PM. Free training on auction procurement ideas: “7 Secrets” call is this week!